Late-night ITV quiz shows and This Morning competitions have been given the go-ahead to return to screens. ITV had suspended premium rate votes and contests and asked independent auditors to investigate concerns that viewers had been misled or overcharged. The ITV Play channel is still being investigated and will stay off air, but some of its shows will now be broadcast in late-night slots on ITV1 and ITV2. 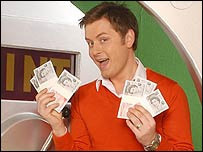 The returning contests were not found to have broken any rules, ITV said. On Saturday, Dancing On Ice also went ahead after being cleared by the review, which is being carried out by Deloitte. An ITV spokesman said: "Deloitte have performed the first stage of their review of the interactive processes and procedures contained within This Morning and ITV Play programming on ITV1. "On the basis of the information available, including Deloitte's findings, ITV is satisfied that both are being operated in accordance with the Icstis and Ofcom codes." At the same time, Ofcom confirmed it was looking into 30 complaints about an episode of ITV1's Make Your Play, which allegedly contained an unfairly difficult question. A graphic asked viewers to "Add the pence" from "Two pounds, 25p, £1.47, 16p, Fifty pence". More than three hours later, the host announced the answer was 506 and that no-one had won. No method was given. ITV has denied the problem was particularly complex but has not commented further. The broadcaster was reported to have been facing losses of £1.5m a week because of its decision to suspend premium interactive services. Earlier this year, ITV Play's Quizmania programme was censured by Ofcom after a question about items carried in a handbag included answers such as a balaclava and Rawlplugs. Broadcaster Five has also suspended all premium rate telephone services after admitting some of its competition winners were faked. Icstis is currently investigating six shows over potential phone-in scams involving quizzes and voting lines. 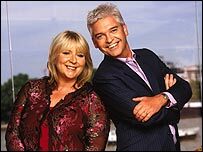 They are Channel 4's Richard And Judy, the BBC's Saturday Kitchen and ITV's X Factor, Ant and Dec's Saturday Night Takeaway, Soapstar Superstar and I'm A Celebrity. It also said it was looking at claims that listeners were allowed to text requests to a pre-recorded show on Virgin Radio. Virgin said the requests were kept to be used at a later date.